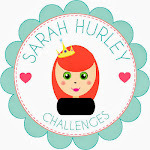 Sarah Hurley 365 (Formerly Sarah Hurley Challenges): Organiser Box. Hello, it's Carol here today and I am going to share something I made using a range of Sarah's products. As some of you have seen, I am in the process of jazzing up the inside of my boring old brown leather Filofax and thought it would be great if I had a wee weekly organiser on my desk so I could easily see what was on that week. I decided to have a browse of the files available from Sarah's Silhouette Store and see what I could come up with. This project has LOTS of different files, so I will link them all at the end, go and grab a cuppa and a biccie and get comfy lol. I had a couple of spare plastic storage boxes from Ikea and decided that one of these would be perfect for what I had in mind. I used the Days Of The Week Tabbed Journaling Cards as my base, as these were a perfect size for the box, and added some extras as I went. I made some cute Number Paperclips so I could highlight days I needed to plan ahead for. I made some Love Heart Paperclips, Star Paperclips and Moustache Paperclips. I have some glassline envelopes from previous kits from Sarah so popped all my spare paperclips in there. We all have calls that we need to make and forget about, so I made a Mobile Phone card so I can pop it in to whichever day I need to make my calls. I had lots of speech bubbles leftover from a LO I made from the Speech Bubble Background and glued them onto pieces of card to be used for anything from ideas to reminders. I used a few different stamps sets to add some details to the cards, and of course some pretty Washi Tape. Here are a few pictures to illustrate my finished make. Thanks for sticking with the post to the end, I hope you like the organiser box and it is something you would try. If you do, please comment below or send us a picture as we would love to see your makes. Remember and pop by again soon and see what my talented teamies come up with. Brilliant project Carol, great way to use the papers so you still get to look at them everyday. Actually you've given me a great idea for storing my stamps on laminated cards in a box like that. Thanks for a great idea.